The ‘Bridge to Nowhere.” Private or public? A citizens group known as ACHD COMMUNITY WATCHDOGS has a Facebook page full of items relating to the Ada County Highway District. A recent entry questioned a bridge over the Ridenbaugh Canal on the south side of Franklin Road at the dead end of Thomas Dr.
Signs on gate blocking street. The waters get muddier. We visited ACHD and viewed their computer maps which are used to determine right-of-way and property ownership. 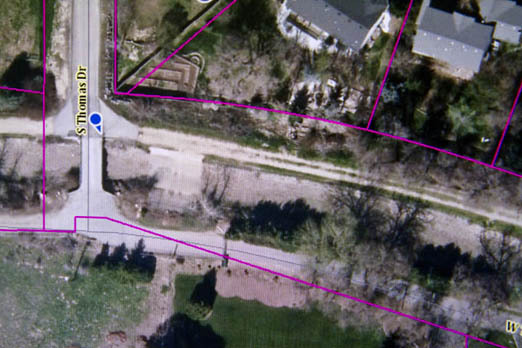 According to the ACHD maps,the roadway behind the private gate is owned by ACHD. ACHD map indicates street at bottom right behind the gate is public. It may just be a matter of a clerical error, a mapping mistake, or an unofficial action that creates the dichotomy, but if the roads are private above the canal, it would seem questionable for the public to pay for a private bridge. If the bridge and roads are actually public, the gates would appear improper. We are concerned that an upcoming decision is being rushed thru that may need additional consideration or to allow the public input on the spending of public funds. The project in question is the widening of the Thomas Drive bridge. The agenda item for Wednesday’s meeting does not even have a link to a packet with additional info. Additionally, this project seemed to be added suddenly and does not show up on the ACHD Integrated Five Year Work Plan. 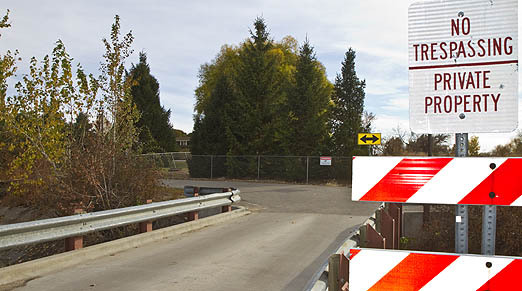 appears this bridge and the road behind the gates are owned by ACHD; yet there was a request to vacate the road in March of 2008 per info retrieved from the City of Boise website. It is unclear if this request to vacate was finalized, but as mentioned prior this road right of way still shows as public. The gate has been across Thomas Drive since at least 2010 but could be earlier based on comments from prior residents as discussed on the Boise Guardian webpage. Regardless of the status of the road, the estimated cost to widen may not fully account for the true costs of widening the bridge. These include survey and inspection of existing conditions, design/engineering and finally construction costs. The $30,000 budgeted seems to only account for the costs to widen and not any design costs up to date. This number may not reflect the actual cost based on future capacity or current Fire Codes. While is unclear the current need to widen the bridge, any work that utilizes public funds should plan for future capacity. This is evident on other projects when ACHD is looking past 2030 to ensure adequate capacity. In the 2040 plan, there is a future collector shown that could easily connect to current stubs that are in the subdivision to the south of the properties that are accessed from Thomas Drive. We would hope the Boise Fire Department has weighed in on several items prior to spending the publics money. The road, turn around, gate width, access and such should also meet the current version of the Fire Codes that are currently enforced. costs also should be included in the actual costs of the projects. What is evident is who lives behind the gate. Both Commissioner Arnold and her current employer, Winston Moore have houses on Thomas Drive based on records from the Ada County Assessor. Based on prior emails that were retrieved via a FOIA request, the discussion of a bridge has been in the works since the beginning of the year, if not prior. This set of emails included Winston Moore, Commissioner Arnold (using her personal email) and Director Wong. · January 30th, Director Wong replies to Mr. Moore that both engineers and maintenance staff had been researching the issues of the bridge and have started to identify costs. · July 2nd Sign is in works to help keep traffic off Thomas Drive (suggestion by Moore and agreed upon by Arnold). · July 11th signs are installed based on an email from Mr. Moore. is being conducted via a method that could be shielded from being freely available by the public for inspection via the Idaho Public Record Act. At the very least, Commissioner Arnold should recuse herself from this vote. She not only lives on Thomas Drive, but has received campaign contributions from her employer Winston Moore, another Thomas Drive resident. I don’t believe you have even close to a full set of facts so I will add some additional information that you may find useful. First of all, the paved area immediately before and behind the West gate on Thomas Drive is not, and never has been, public right of way. Mr. Moore owns property behind the West gate and installed that gate. I moved to another property on the west side about 2 years ago. The concerns regarding the bridge were raised initially by Donald Barksdale, who lives on Thomas Drive as well. Both he and Mr Moore had numerous conversations with District personnel and District personnel visited the site several times. During the course of reviewing the matter, district personnel acknowledged that the bridge was substandard even at the time ACHD constructed it. The bridge is a single lane side and moreover the public pavement beyond the bridge is not wide enough to allow some vehicles to access the propeties. One of the most important issues that came to light is that the larger fire department water tank truck that would be needed in the event of a fire cannot access the site and there isn’t room for residents to flee as fire personnel come in. There also isn’t sufficient room on either side of the bridge for maneuvering or multiple vehicles. Since there is not any public water supply (all the properties have residential wells, some are shared wells) and there are no fire hydrants on Thomas Drive, the lack of adequate access for fire vehicles is a serious public safety issue and potentially life-threatening. Normally, Director Wong has the authority to direct ACHD personnel to remedy a life safety issue and expend funds to do so up to certain limits without involving the Commission and normally the Commission would not have taken action on an issue like this one. However, in this case, Commissioners Baker and Woods (and others) for political reasons stopped the normal process and directed that nothing be done until after the election. Apparently the City or County allowed the original developer/subdivider to plat the property and develop without adequate access and ACHD made matters worse by installing a substandard bridge. The folks who live in the 8 residences on the south side of the bridge (ranging in age from about 5 to 94) are innocent victims of government incompetence and should be entitled to have their lives protected just as any other citizens of Ada County, regardless of their race, social economic status, etc. Being proactive seems to make more sense than waiting for a tragedy (like the Oregon Trail heights fire) before taking action and risking liability to the District for failing to remedy a known life safety issue. I met with the fire department personnel and have knowledge of the access problems/impediments to adequate fire fighting. Widening the bridge by eight feet does not result in a great bridge or great access but it would solve the fire access issues at a relatively low cost. Regarding email, there is nothing nefarious about the use of private email. My email address and cell phone number are widely available and published (I am the only commissioner who allows publication of my cell number every Sunday in the Statesman column) so it is not unusual for me to get email at my personal email address. I do, however, for official ACHD matters, reply to such emails with a cc to an ACHD person or my ACHD email account so the the emails are captured and automatically archived by the ACHD server and easily available. I often also forward the original email to an ACHD account so that the emails are automatically archived. I am probably particularly sensitive to fire issues as my mother recently burned to death in a house fire. Walking through the ashes of a loved one’s home and attending the funeral are life changing. Anything that can be done to prevent such tragedy is worth doing. I would hate to see politics, political paybacks, personal vendetta, personal beefs, personal bias or the likes of that put innocent lives at risk. Certainly not my call. I grew up on Thomas Dr. Thomas Dr. was always a private road and all maintenance was paid for by the property owners. It was private all the way to Franklin Rd. The original bridge was damaged by an overloaded truck (it was wood) back in the very early 80’s. I do not know how the new bridge was paid for (private/public or insurance money). Since the gate was placed beyond the bridge, I assume that the county took possession of the road up to and including the bridge. It is private beyond that. A couple of very well known individuals live on that street now, one in my childhood home. The county assessor maps are official. Does ACHD use the assessor maps? The map in story could have an arrow pointing to the actual gate because it’s difficult to see from directly overhead. Looks like a nice isolated little spot. I initially vote they pay for their own bridge or allow the roads to be made public and someday connect to adjoining neighborhoods. However, please consider this is mostly someone jealous I don’t have my own isolated private island in the middle of Boise. I might also remind you that Obama and his friends based all decisions on making everything absolutely fair for the 99%. This means we all, globally all, needed to live in a shipping container to make it fair. Thus fairness can be a really stupid concept. Stupid and Communist. In the end reasonableness prevails and I withdraw my vote. Instead I favor of paying attention to something that really does matters. Such as why the new Cloverdale bridge will not also be a new freeway interchange. WTF are they thinking?? How about an article about that bizarre planning editor?? Wow, there is a couple grand worth of ACHD signs on that private drive. How do I get ACHD to pay so much attention to detail in my neighborhood? A quick visit over to the Ada County Assessor’s website reveals who owns the properties served by the bridge to West Thomas Drive: Charles W. Fawcett, Rebecca W. Arnold, WDM Trust, Donald C. Barksdale, and Winston H. Moore. Arnold is the ACHD commissioner for the 2nd district and also general counsel for the W.H. Moore Company. The home owners on W. Thomas Dr need to form an HOA and pay for their own dang bridge. Don’t ask me and other Ada County residents to pay for a new driveway into a private gated community, if that is in fact what this is. Get off the dole! If it is marked PRIVATE then the OWNERS PAY. If it is PUBLIC and the signs come down then maybe it is public – – maybe. They cannot have it PRIVATE and have ACHD pay – cannot have it both ways! This is nothing more that self serving individuals trying to get taxpayer to foot the bill – nothing more. Anyone else have such a DROP in taxes????? Over HALF from 2015 to 2017. Wow!!! The adjacent residential properties increased during the same time. The county record shows the valuation is based on BOE (Board of Equalization)… when the county assesses a property, the property owner can appeal to the BOE. Usually, the effort is equivalent to peeing in the wind. But I suppose if one is an ACHD Commissioner, the BOE may look more favorably at REDUCING the property valuation. It’s no wonder C Arnold doesn’t object to an ACHD tax increase for everyone else. Hers, uniquely, is going down. To be fair, this could be a life and safety issue, but then the whole project should be evaluated to make sure this bridge widening by 8 feet is not just a bandage to be fixed later. If ACHD had provided the staff report with the original ask by whomever and Boise Fire concerns, then ACHD might look better in the public’s eye. Until then, we only have the 12 emails and whatever has been found online. Tucker and I have a request to find the record of decision regarding the 2008 Vacation agreement. Records from the Ada Assessor showing payment of taxes on this property would also be interesting. And shouldn’t Rebecca Arnold’s home value be double or triple the amount shown in the records??? I searched Thomas Drive on the ACHD website and they give no history of the bridge or whatever the action is supposed to be. It seems suspect to me. This takes me way back to when ACHD would build new driveways and walkways on newly built homes and properties owned by the then ACHD director’s brother, who ran a RE development company, in the 80s. Yeah, nothing has changed. I did a brief news search and there are a few ACHD hits but nothing about this in the legacy media. Probably can’t find a dress for the reporter that goes well with that ugly green gate in the background? I did see a kivi story indicating ACHD would punish the citizens outside the city limits with budget cutting. The failed ballot measure is a sore spot apparently. I’m wondering if they are still going to build themselves a new building? I’m wondering if they will find away to increase fees on the super heavy vehicles doing 99% of the road damage? Legacy media never asks the stuff I want to know because they are so dependent of government for advertising dollars. And those hot dresses on underpaid reporters are not cheap. Thanks for your useful informative coverage Editor. Good work Guardian. Ima pimp this one. If we could get one more ex Boise City Council Member on the ACHD Board then Mayor Beiter could also control ACHD. That would quickly put a stop to projects west of the West End and south of Franklin. Rebecca Arnold lives near/next to Winston Moore. She is also chief legal counsel to Mr. Moore’s company. Rebecca Moore is an ACHD Commissioner. EDITOR NOTE–Not sure where she lives. She does own property in the subject area. Per the assessor’s records Rebecca Arnold is receiving her homeowner’s exemption for the property on Thomas drive. So who is going to pay for the money that was spent by AHCD on design and signs at taxpayer expense in July – as per the report on Mr. Wong’s meetings and activities above? They used tax payer money in July. Reading this with enthusiasm, believe this issue is dead the wonderful readers have commented on articulately should not let this fall off the radar this is legitimate conspiracy extortion ethics violations more than that you can count complete violations of everything that’s good and true. If one were looking for a legitimate cause to upset the current city council and it’s unbalanced and the achd connection this is a good place to start.